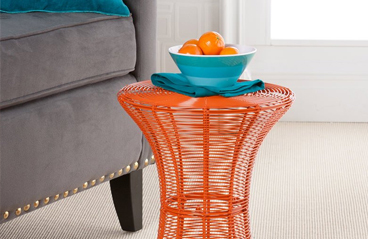 Why it’s awesome: This table adds a pop of color to any room. Put it next to your standard-issue dorm bed or plain gray couch, and boom! Instant design appeal. It’s big enough to fit a laptop for long cuddly nights of Netflix. 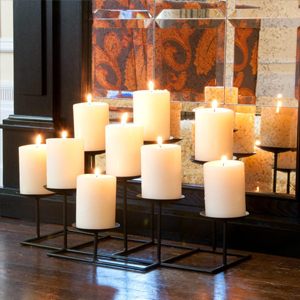 Why it’s awesome: This black metal candelabra will illuminate your entire room with soft, flattering candlelight. It has nine metal platforms to hold 3” wide candles that will burn all night. We’re talking serious candle power here, so be sure not to use it as a clothes rack at the same time. Why it’s awesome: You don’t have to throw your books in a pile on the floor anymore. 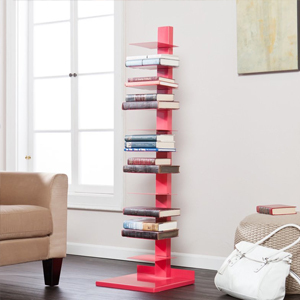 This book tower will hold big bad textbooks up to nine pounds each. The color alone gives your room an artistic pop, and the irregular pattern of different sized books makes it even more eye-catching. What design tips do you have for dorms and campus apartments? Hit up our Facebook page and let us know how you’re planning to decorate this year. Have fun!